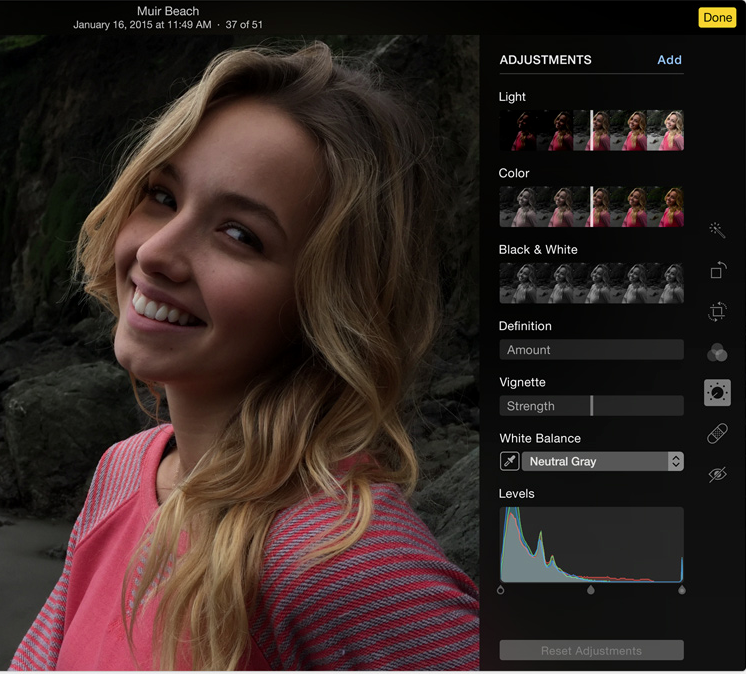 Apple has let loose details of its brand new Photos app — the expected replacement for both iPhoto and Aperture. Today, the new app was bundled into a beta version of OS X 10.10.3, which Apple made available to its developers. Overall, the look is simple and uncluttered, borrowing from the iOS Photos app, the desktop iPhoto and Aperture. Heavily integrated with the iCloud Photo Library and completely re-engineered, the new Photos app is designed to let you access any photo in your collection at any time and from anywhere. An Optimize Mac Storage option facilitates storage of full resolution photos and videos in iCloud while lower resolution versions are saved to your device. With iCloud, you automatically get 5GB of free storage and can purchase up to 1TB. Users of Yosemite and iOS 8 have the complete advantage with the new Photos app in that any new photos or video files are immediately distributed among all platforms. Edits are also saved across the board. The organization of Photos will look familiar to anyone who uses Photos for iOS. Moments, Collections and Years views are on hand for organizing, while a toolbar lets you key into your shared photos, albums and projects. Added to Photos are more advanced editing tools. A completely reorganized toolbar gives you Aperture style editing tools in a clean, updated layout. Controls include Light, Color, Black & White, Levels, White Balance, Definition, Vignette and Revert. One would be hard-pressed to find much interface similarity between the new Photos and the old iPhoto. Something that will also look familiar are the filters — Mono, Tonal, Noir, Fade, Transfer and others — borrowed directly from the iOS Photos app. The Photo Sharing functionality also bears some similarity to both iOS versions and the old desktop apps, making it easy to share with popular social networks like Facebook and Twitter and other compatible sites that support sharing extensions. Like iPhoto and Aperture, you can also do advanced projects like photo books, photo prints, and greeting cards via the Projects interface. Overall, Photos borrows liberally from the iOS interface and folds in much of the functionality of iPhoto into a completely reorganized and inviting looking app. While it does dive into some of the more intricate edits, most of the professional sector of the market served by Aperture has been eliminated. The emphasis is on iCloud integration, non-complex edits and easy sharing targeted to consumers and enthusiasts. While developers get to play in the Photos sandbox, the rest of us will have to be content with Apple’s preview of the new app until it’s released in the spring.